Do you need to saw trees with less manpower but still work quickly and efficiently? With the grapple saw from GMT Equipment, you can saw, fell, prune and transport trees with one machine. GMT Equipment also supplies the assembly system for the grapple saw GMT035. We like to make life easy! Simply mount the grapple GMT035 on the container truck. It is fairly obvious, how it is to be used. Extra hoses are not required; ideal for our clients. And even more important? You are working in complete safety; a cherry picker is not required! One team is all that’s needed to saw trees, bring the sections to the ground, gather them together, cut them up and transport them. So, you don't need as many people. Thanks to the low-maintenance construction, the grapple saw GMT035 is a responsible, long-term investment. Want to save time, costs and manpower? Combine the felling head with the quick coupler GMTC10. This gives you greater flexibility. The smart construction means you don’t have to adapt your machine. You mount and change the grapple quickly and easily. 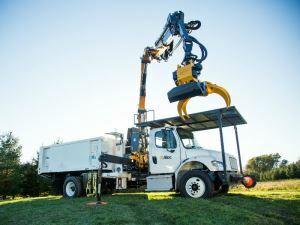 Since 2017, the GMT035 is part of the Heartland Truck of Altec: a Freightliner truck with an Effer knuckle boom crane (a folding crane) and the GMT035 grapple saw. Using this ‘Self-Contained Tree-Removal Unit’, tree care becomes safer and more efficient. Want to share or read the information about grapple saw GMT035 later? Click on the button and download the brochure. During the week between 08:00 and 17:00 you can contact us on WhatsApp.